Every so often I fall in love with a product, become simultaneously addicted to it and wonder why I haven’t been using said product in my life thus far. It’s also an added bonus when the item costs a meager £1.50! 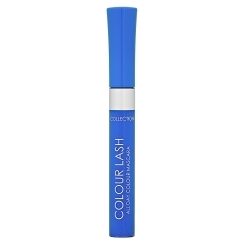 I am talking about my new lover affair with Blue mascara. It’s nothing new or innovative to the beauty market and was popular decades ago but I’m leading a revival – and this time it works on blue eyes too. Traditionally blue eye makeup was reserved for brown eyes, like purples work best on green eyes and coppery browns best on baby blues. This colour from Collection makeup is perfect for every eye colour, I don’t know why it just works. For those of you interested in texture this is not a false lash effect mascara so i would recommend using it on your falsies or on top of a clear mascara for added length and volume. I like it one its on in day time for a pretty pop of colour. It also lasts all day, no flaking. THE BLUSHER FILES: CREAMS, POWDERS, GLOW-GETTERS, OH MY!